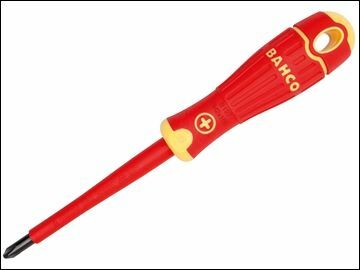 Bahco Insulated Phillips Screwdrivers are suitable for work on live equipment, up to 1,000 Volts. They have 2-component handles with vertical grooves for comfortable grip and maximum force transmission. The blades are made from high performance alloy steel, which is chrome plated and entirely hardened. The black finish tip provides higher accuracy. Each screwdriver is branded with part number, tip symbol and size for easier identification. They are each individually tested and manufactured according to IEC 60900 and conform to ISO 8764.